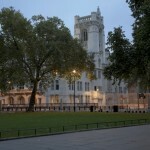 Listed from Monday until Tuesday 29 January 2013 is the appeal of SL v Westminster City Council, to be heard by a panel of five (L Neuberger, L Hale, L Mance, L Kerr and L Carnwath). The respondent Iranian national’s asylum claim was based on fear of persecution on account of his sexual orientation. His claim was refused and he became homeless, then after learning of the death of his partner in Iranian prison he attempted suicide. It is for the Supreme Court to determine whether or not the respondent was “in need of care and attention”, and if so, was it “otherwise available to him” for the purpose of the National Assistance Act 1948, s 21(1)(a). Case details are available here. On Wednesday 30 January 2013 is Davies & Anor t/a All Stars Nursery v The Scottish Commission for the Regulation of Care. The appellants operate a children’s nursery, which was registered with the respondent council until the council gave notice of its decision to cancel the registration. The appellants contested the decision, but new legislation established two bodies in place of the respondent, and responsibility for regulation of children’s nurseries was transferred to one of them. The issues in this appeal are: whether the respondent remained in existence after 1 April 2011 for the purpose of the appeal against its decisions to cancel the registration of the appellants’ nursery; whether Social Care and Social Work Improvement Scotland took the place of the respondent after 1 April 2011 for the purpose of conducting the appeal; and whether the Supreme Court should entertain the present appeal. Here are the case details. On Thursday 31 January 2013 the appeal of Aitchison & Ors v South Ayrshire Council was listed, but it has been removed from the timetable. On Wednesday 30 January 2013 the Supreme Court will hand down judgment in B (Algeria) v Secretary of State for the Home Department. In the Privy Council on Wednesday 30 January 2013 is the appeal of New Falmouth Resorts Ltd v International Hotels Jamaica Ltd. The matter concerns an order of the Court of Appeal of Jamaica dismissing a claim for a plot of land. Case details are available here. Leave a reply on "In the Supreme Court w/c 28 January 2013"